Debates between identitarians and socialists often break down around one central point of contention: identitarians believe that a movement for change must be inclusive towards all oppressed identities, and accuse socialists of “class reductionism,” which to them translates as “you only want to fight for your identity, which is defined by class.” This is wildly inaccurate, but not in the sense that the opposite is true; rather, it stems from a complete misunderstanding of socialist thought and history. The fundamental problem with cramming poor people into the identitarian framework is that, unlike every other identity treated in that framework, justice for poor people requires their elimination. The appropriate remedy to racial oppression is not to make everyone white, nor is the appropriate remedy to gender oppression to make everyone male. But the appropriate remedy to the “oppression of the poor” (as identitarians describe it) is to make them no longer poor. Poorness is not an identity to be celebrated or lifted up; it is an identity to be done away with altogether. The oppression of poor people is that they are poor people. The same cannot be said for any other marginalized group. Identitarians, then, usually aren’t actually concerned with class; they’re concerned with classism. Their objection is to the way snotty rich (or middle-class) people treat poor people, not to the system that produces these divisions in the first place, and – as with other forms of identity – their suggested solutions usually come down to a fairer integration into the capitalist system, or measures that will allow a small percentage of people (ideally artists, activists or academics) to achieve middle-class status. Since identity politics, and therefore intersectionality theory, are a bourgeois politics, the possibilities for struggle are also bourgeois. Identity politics reproduces the appearance of an alienated individual under capitalism and so struggle takes the form of equality among groups at best, or individualized forms of struggle at worst. In the identitarian view, class should be treated as no more or less important than any of the other forms of social identity. To elevate it beyond that disregards the other identities and is therefore racist, sexist, oppressive, reductionist, etc. But in the Marxist sense, class isn’t a social identity; class is a relationship to the means of production. It’s not just that the solution to the class problem is different; it’s that “class” describes an entirely different manner of thing. I can’t emphasize this enough: Marxism isn’t elevating one identity over another, because it never assumes that an economic function in capitalism is the same as a social or cultural identity. Nor is class a personal issue – it doesn’t matter whether the rich are nice or mean, whether the poor are saintly or beastly. It’s not about how one defines oneself or what is offensive and what isn’t. It’s about how production is organized. Who owns the factories? Who owns the land? Who owns the housing? How are resources distributed? How is this vast and impressive apparatus of workers, technology and knowledge employed? Marxism examines the structure of our economic system and finds that the entire thing is geared towards creating profit for one very small class of people, while completely failing to represent the interests of the majority of people – the people who actually do all the work, but own none of the results. This isn’t because the people who profit from this system are lacking in awareness of their privilege, or because they are classist. It has absolutely nothing to do with them as individual people, their social identities or minority status. A disabled black female capitalist is exactly the same as an able-bodied white male capitalist in the function they serve in the system, which is also why electing people of a different social identity has never by itself made a political difference. The relationship between class and identity as understood by socialists is also quite different from that of identity politics. Identity politics is built around ideology; that is to say, it sees the world as being primarily shaped by how we think about it. Socialism, on the other hand, argues that ideology exists to justify material conditions. Identity politics believes that slavery happened because of racism; socialism argues that racism was invented to justify slavery, but the real cause of slavery was – to put it bluntly – money¹. Where identitarianism seeks to somehow unify the world’s often highly contradictory personal narratives of oppression into a coherent idea of social justice, Marxism looks at what makes the system itself tick, and finds that the vast majority of people have something very real in common: their position within the economy, i.e. their relationship to capital and the means of production. It’s around this that it seeks to rally people – not around moral or personal judgement, but around their objective common interests. Ideologies of social division, in the socialist view, mainly exist to keep people from realizing precisely those interests. Divide and conquer, as they say. Socialism does not seek to unify people on the level of social, national or cultural identity; it is inherently internationalist and transcultural, because it operates on a completely different level. But that’s precisely why socialism is emancipatory by necessity: because to unite the working class means to unite people across the barriers of identity. The concept itself is inclusive, and cannot be realized without the inclusion of the majority of people, including people of all social identities. Nor does it exclude those who wish to see systemic change but belong to the upper classes; after all, it’s about reorienting the goals and methods of the system, not about personal moral judgement or the condemnation of people because of an accident of birth. Socialism does not posit some sort of economic equivalent of Original Sin that makes people unable to see beyond their own lives. Historically, identitarian ideology is a product of the failure of the Left. The various forms of identity politics associated with the “new social movements” coming out of the New Left during the ’60s, ’70s, and ’80s (feminism, black nationalism, gay pride) were themselves a reaction, perhaps understandable, to the miserable failure of working-class identity politics associated with Stalinism coming out of the Old Left during the ’30s, ’40s, and ’50s (socialist and mainstream labor movements). 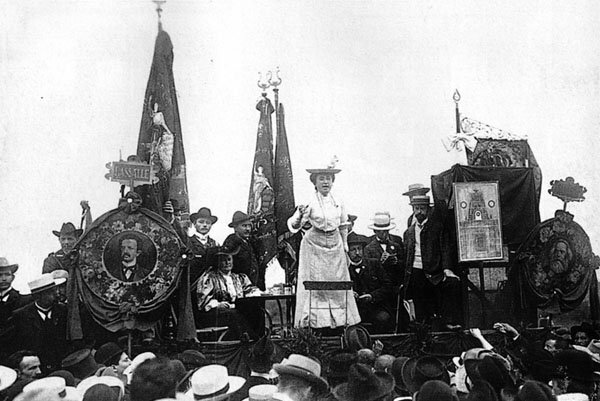 Working-class identity politics — admittedly avant la lettre — was based on a crude, reductionist understanding of politics that urged socialists and union organizers to stay vigilant and keep on the lookout for “alien class elements.” Any and every form of ideological deviation was thought to be traceable to a bourgeois or petit-bourgeois upbringing. One’s political position was thought to flow automatically and mechanically from one’s social position, i.e. from one’s background as a member of a given class within capitalist society. The catastrophic failure of the international Left in the face of Stalinism is a lesson in the dangers of identity politics – not only for advocates of intersectionality, but for all those who wish to cause meaningful changes to society, including socialists. It’s not possible to build a progressive movement around concepts of cultural or personal purity. No matter how oppressed one is, no matter what horrors one has experienced, genuine systemic change can only occur through an understanding of the objective issues that bind us together; only through the struggle to change the material conditions that produce ideologies of discrimination can we finally destroy those ideologies and create a society in which people can be free. Either we’re fighting for everyone, or we’re fighting each other. This is clearly a simplification for the purpose of explaining the principle. Note that by racism I mean the belief in biological races, not xenophobia in general, and by slavery I mean the African slave trade, which predates such theories. This was originally a bit clearer, before an edit removed some quotes that I felt were driving the article off course. The main point is that the root of slavery was financial interests, not hatred of black people.